If we want to understand how a publisher can yield the most revenue from their site while still delivering a satisfying user experience, it’s important to understand how visitors consume content on a page. This is especially relevant with the modern, long scroll layouts of many web pages. If most visitors scroll - and expect to scroll - why are we front-loading all of our pages with above the fold ads? We also need to determine whether below the fold (BTF) ads can out perform. The first step is to figure out how a typical web page is viewed. According to eye-tracking studies by the Nielsen Norman Group, readers scan through a page in an F-shaped pattern, predominantly from left to right, and far beyond “the fold”. As for whether or not ads are being seen at all, Nielsen Norman continued with research applying the eye-tracking technology to a study of ad blindness. The study tracked eye-movement over webpages that contained ad banners and the results showed that ad banners were completely ignored. If this study shows that the ads placed on the page are not getting even a cursory glance, despite being placed immediately adjacent to the content of the page, how can we conclude that the web is an effective medium for advertising? To date, the simple, and incorrect, solution for advertisers to make ads more effective is to place their creatives in highly visible places on the page. This means that advertisers push to have ads placed above the fold and forced into the viewport via techniques like popups, or by creating movement or sound. This is generally in opposition to how publishers want to design their sites. Publishers want ads on their site so that they can generate revenue from the content that they produce. Publishers want to be able to present their content so that readers will return to the website, and by doing so create a sustainable business. Publishers have no desire to use popups or videos that will distract from the main content of the page. There is clearly a disconnect between advertisers and publishers and what each party is trying to achieve from online advertising. Here at Sortable, we have the ability to tap into data collected across our network and analyze how ads perform across a variety of dimensions. We decided to run a test to see how the placement of ads on a page affects CPMs. Our findings show that some of the highest CPMs are given to ads that are located within the typical reading patterns described by the eye-tracking study. These ads are typically interspersed with the content of the page, and are thus more likely to be visible. If ad blindness is a real issue, then placing ads in areas of high visibility - inline with content - is a great way to help minimize its effects. 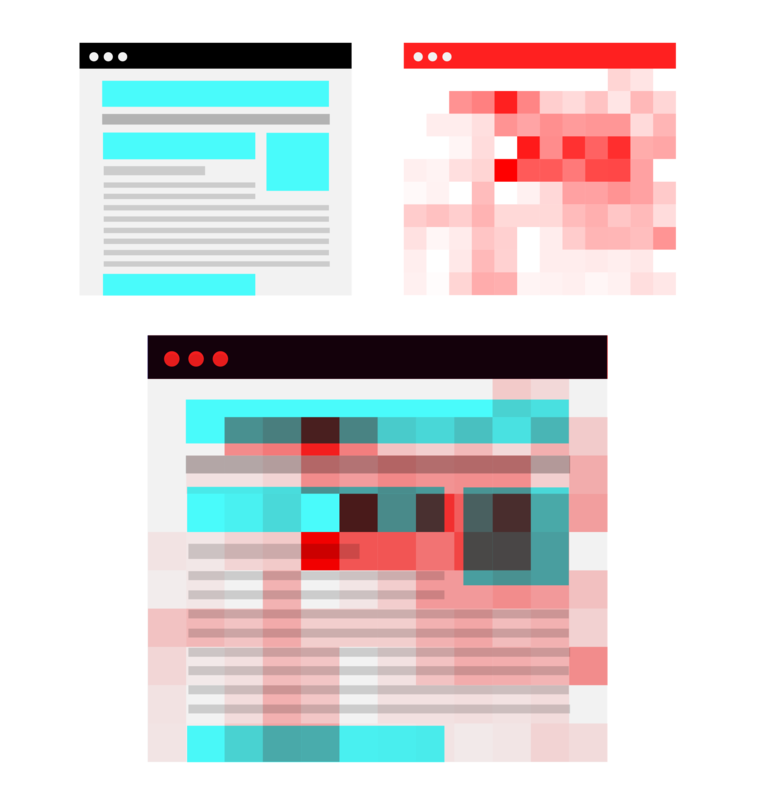 As an example, we’ve made a heatmap of the average CPMs across Sortable’s network of sites along with a wireframe to illustrate what an optimized page layout might look like. 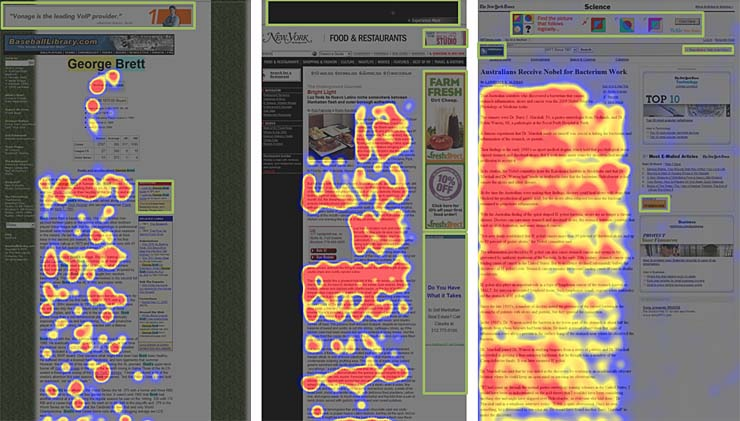 The highest CPMs are found right where we expect them: in the middle of the page, above the fold (top two-thirds of the heatmap). What we should be noticing is how underused BTF ad space is, and how much potential there is in adding ad slots below the fold (bottom third of the heatmap). 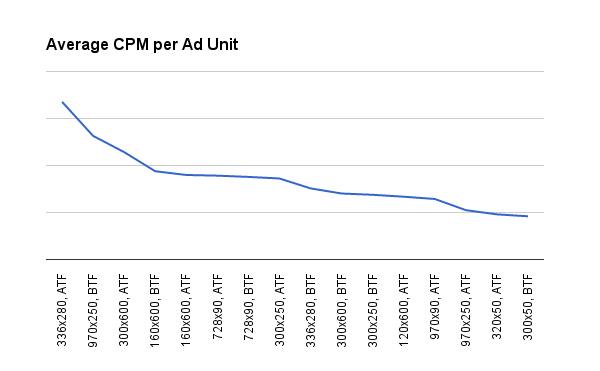 We’ve also found that some of the top-performing ad units, by average CPM, are BTF placements. This strongly suggests that a layout that balances ad placement with content both above and below the fold, should yield higher revenue than a web page with ATF-heavy ad placements. Optimizing the page layout to include ad placements through the whole design holds a lot of promise as a way to ensure that the business of selling ads online is sustainable for both advertiser and publisher. At Sortable, we use our owned and operated sites to test different page layouts and optimization techniques, and we’ve learned a lot about how to best design a page with ad placement in mind to yield the highest CPMs. The best practices described by Google suggest placing ads in-line and along the viewing paths of readers as we’ve shown with our heatmaps above. If ads are already being placed in locations that are viewed and clicked on by viewers, what can you do to generate more ad revenue on your site? One option is to use header bidding to lift CPMs. While header bidding is not a perfect solution, it can provide great returns with only a couple of side effects. We’ve also previously studied the effects of colour on AdSense performance. We found that when we were able to control the look of the ads being served, we could increase the overall ad performance by relating the colours of the ads to the theme of the website. Further optimizing the size of the ad unit to match your content can also make a difference. We’ve seen (and so have others) that medium-sized ads can be more easily inserted inline. There is also an ample supply of medium-sized creatives, keeping the impressions fresh. This directly influences, and can increase, the revenue that that ad space can generate over time. All of these techniques can lead to a much more sustainable and profitable relationship between advertiser and publisher. This type of relationship is something that Sortable works hard to manage every day. Find out how Sortable can help you optimize your ad inventory and help boost your revenue.